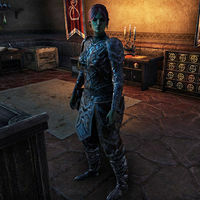 Atzurbesh is an Orc leatherworker who runs Tenfold Tannery in the Tanners and Miners Hall of the Canton of St. Olms the Just in Vivec City. "Orcs make the best leather crafts in the world and don't let a Dark Elf tell you any different. Go on, take a look. See the truth for yourself." "Sometimes I just want to chuck it all and return to Wrothgar. Then I remember how the stronghold Orcs treat their women and I say tusk that! I'll stay right here, if you please!" "You look like you've had enough of that heavy, bulky armor. My leathers breathe! They have give! And they look great, especially on someone with your physique. So, want me to help you get into some leathers?"